Full Disclosure: This recipe is sponsored by OXO Good Grips. They provided me with several new tools to test and review in exchange for my participation. All comments are my own. Have you ever tried a Cornish Hen? Well, if not, let me just go ahead and tell you, “It tastes like chicken.” There, how’s that? Smile. I must admit, to the best of my knowledge I’d never had a Cornish Hen until I finished this recipe. I don’t know why, I just hadn’t. But, I will not overlook them any longer. Each bird is a perfect serving for a “manly” meal. Maybe even two servings. In talking with a friend last year after Thanksgiving, I asked him if he enjoyed some turkey for the holiday. He replied that he hadn’t and proceeded to tell me that instead of a turkey, his wife would always cook two Cornish Hens, one for him, one for her. They just didn’t need a big old turkey for the two of them. That peaked my curiosity and I’ve been thinking about trying them for myself ever since. A couple of weeks ago, I finally picked up a package at the supermarket, brought them home and placed them back in the freezer. You’ll probably find them in the freezer section at your local market. A few days later, our friends over at OXO Good Grips invited me to participate in a “Sheet Pan with a Plan” promotion they were offering. Well, I love working with OXO and I’m always eager to see what new products they are offering. When I read about what they were looking for, I knew right then what to do with the Cornish Hens in the freezer. How’s that for good timing? Cornish Hens are actually just young boiler chickens, so yes, they do taste like chicken. Smile. And, when you combine a couple of them on a sheet pan with some of your favorite vegetables, you can roast up a complete ONE PAN meal in hardly any time at all. How cool is that? The recipe is simple, and I’ll show you the new tools that OXO sent for testing and review. So, if you’re ready to cook up a quick and easy sheet pan dinner, let’s head to the kitchen, and… Let’s Get Cooking! 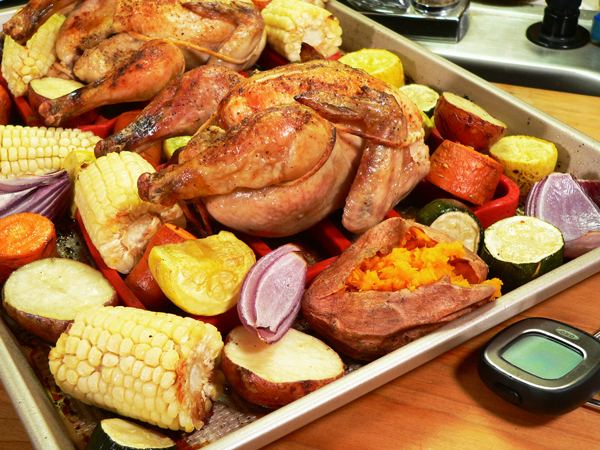 Cornish Hens – Sheet Pan Dinners recipe: You’ll need these ingredients. The choice of vegetables you cook with your Cornish Hens is entirely up to you. I’m just using these as a suggestion, and I didn’t even use all of the vegetables pictured to complete this meal. Opening a box of new kitchen tools from OXO is about as good as Christmas. These are the new items that OXO provided me with to complete this one sheet pan meal. Let’s take a closer look and then we’ll get into how to prepare the full recipe. The images above are courtesy of OXO Good Grips and give you a better idea of what we’ll be working with. I’m always excited to add new products from OXO to my collection because of the quality they put into each and every product. If you’d like to learn more about any or all of them. Click a link below. 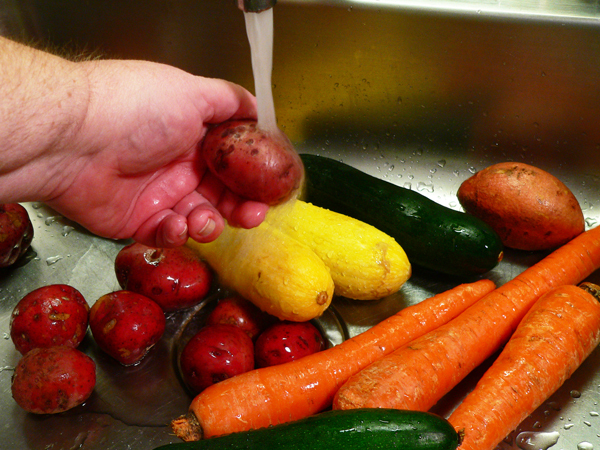 Rinse your vegetables under cool running water as needed. 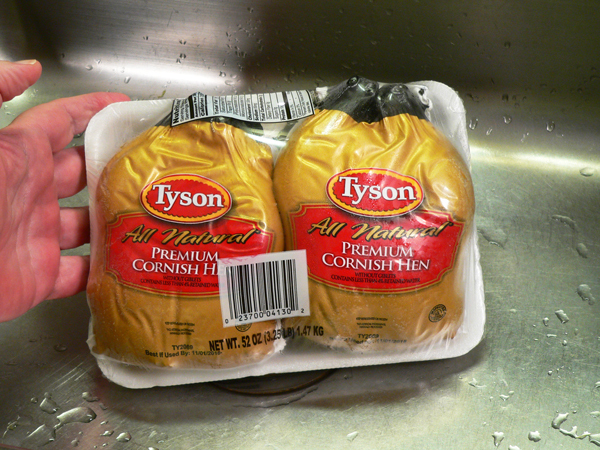 Set them aside to drain while we prepare the Cornish Hens. 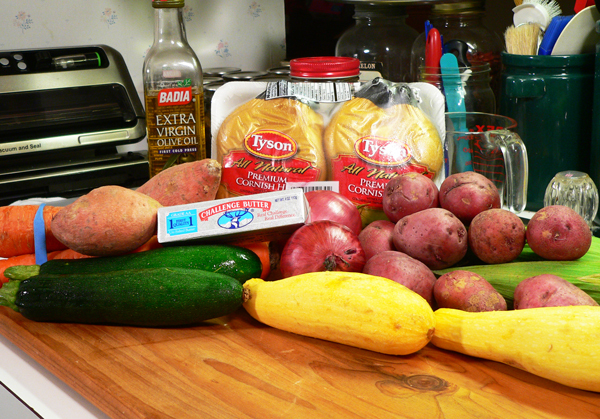 As mentioned, these are just the vegetables that I used, you might prefer some different ones. I always encourage you to take a recipe and make it your own. You know best what you or your family likes or dislikes, so select vegetables that will work best for you. These were frozen Cornish Hens that I thawed in the refrigerator prior to starting to complete this meal. Most of what I’ve seen generally come with two of them packaged together but that may be different in your area. These are sometimes called Cornish Game Hens, or you might find a Rock Cornish Game Hen. It’s called a “hen” but can be either male or female. These are young broiler chickens that grow to about 28 to 30 days old compared to most chickens that are grown to about 42 days or longer. Cornish Hens typically weigh less than 2lbs each. You’ll need to give them a good rinse under cold running water. Rinse them inside and out, removing any pin feathers that might be left on the bird. Some come with the giblets inside, much like you’d find inside a turkey, but the two I have were sold without them. You can also truss the hens if you’d like. That step is optional. I decided to inject one of the hens with some NC Eastern Style Vinegar Based BBQ Sauce. Since I hadn’t had a Cornish Hen before, I only did one so I could still see what it would normally taste like. I love that the OXO Flavor Injector comes with two different sizes of needles, one for thin marinades and another for thicker marinades. Injecting the birds will add moistness and more flavor. Use a homemade marinade or purchase a favorite from your grocer. Something as simple as melted butter will work great. Try not to pierce the skin when doing this. 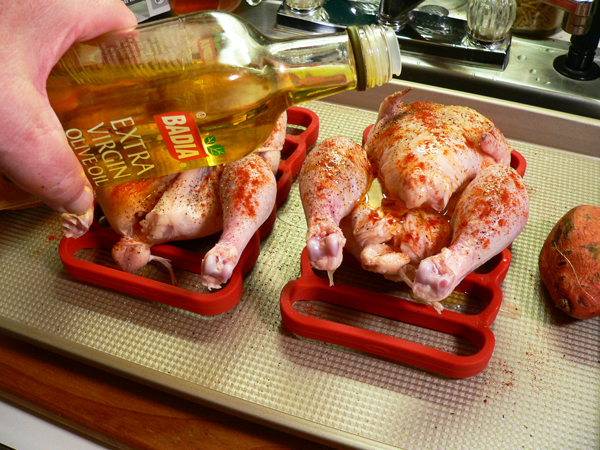 Find an exposed part in the breast, legs and thighs to inject a bit of your marinade. The Flavor Injector made this part super easy and both needles store inside the unit when not in use. I placed the two Silicone Roasting Racks on the sheet pan, then placed the hens on top, one on each rack. You can use these separately as pictured, or place them close enough together to use them as one. You can even stack them on top of each other to raise the meat up higher. The racks keep the meat up above the fat and liquid for healthier cooking and its design allows air to circulate around the meat for faster and more even cooking. They turned out to be just a perfect rack to hold one hen. I’m already the proud owner of the OXO Pizza Pan, and their Muffin Pan, so I know this sheet pan is a quality made product that will serve me well. Season the hens as desired. I used a little Salt, Black Pepper, and some Smoked Paprika on these. Garlic Powder would be good, maybe some onion powder. Lots of choices depending on the flavor you desire to achieve. Please note that I also placed two Sweet Potatoes on the sheet pan as well. Since these will take about an hour to bake, I wanted them to go in the oven at the same time as the birds. I also drizzled a little Olive Oil over the birds. Now, let’s get them in the oven. Place the sheet pan in your preheated oven that should be set to 350F degrees. The hens will need an hour or longer to roast in the oven, but the vegetables I’ve chosen will not need that much time. We’re giving the hens a “head start” on the cooking process. Smile. 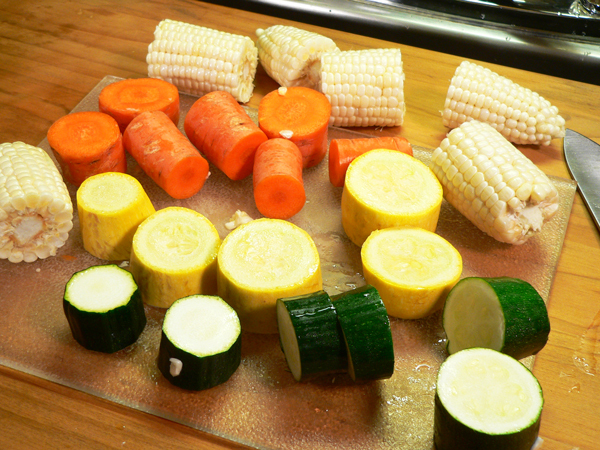 While the hens are getting started in the oven, go ahead and slice your vegetables into large chunks as desired. The squash and zucchini will shrink up a bit as they cook, so even larger pieces become bite sized when roasted. I probably should have cut these really large carrots into smaller pieces though. We’ll see. I was tossing the chunks into a large bowl as I went. I figured as long as they were here, I might as well go ahead and drizzle some Olive Oil on them as well. Afterwards, I used a large spoon to toss them around to make sure they were pretty well coated in oil. You could certainly just place them on the sheet pan and drizzle them a bit with Olive Oil later. After the hens had roasted in the oven for 30 minutes, I removed the pan and spread the sliced vegetables all around the pan. Keep them in a single layer but fill the pan up. This is also a good time to sprinkle the vegetables with a little salt and pepper if you’d like. As you might can see, I stacked some of the vegetables right up next to the birds on the silicone racks. I also melted some butter in the microwave and brushed it on the Cornish Hens before placing the sheet pan back in the oven. There was a little oil in the pan, but not enough to baste the birds with. Place the sheet pan back into the oven and let it all cook until done. It took me an hour and 15 minutes to completely roast the Cornish Hens, so this gave me about 45 minutes for the vegetables to cook. The packaging on these hens said they should be cooked to an internal temperature of 180F degrees. Most sources say poultry is done at 165F degrees so I’m not sure what the difference here might be. One of the best kitchen tools you’ll have for cooking any type of meat is a digital thermometer. I highly suggest you add one to your collection of kitchen tools, and this OXO brand Chef’s Precision Digital Instant Read Thermometer would be a great choice. It’s large dial makes it easy to see the temperature of your cooked meats and it displays in either Fahrenheit or Celsius by just a simple button on the back. The head swivels so you can easily get a good reading and it shuts off automatically in case you fail to cut it off to preserve battery life. It also comes with a case that has a printed guide on the outside to help you remember what temperature certain meats should be cooked in order to be safe. Once you remove the pan from the oven, let the birds rest for about 10 minutes prior to serving. Everything here turned out perfect except for the carrots. I would probably use baby carrots the next time, or perhaps I should have added the carrots when I first placed the pan in the oven. The birds were just right, and the sweet potatoes were nicely baked. What do you think? Look good enough to eat? Sheet pan dinners are a wonderful way to prepare a meal quickly and easily. While we didn’t get everything in the oven at one time, it was a simple matter to add the vegetables later into the roasting cycle so we didn’t overcook them. I do hope you’ll consider giving our recipe a try and I look forward to reading your Comments in the section below. Special thanks to our friends at OXO. It’s always a pleasure to work with you. Thank you for your trust in my honest evaluations of your products. Hopefully we can do it again. Update November 10, 2017: Just wanted to add that all the tools I used here were super easy to clean up. I just wiped most of the drippings out of the pan with a paper towel, then a quick rinse in hot soapy water left my pan looking good as new. The injector comes apart easily for cleaning. Silicone racks were easy to clean, and the digital thermometer just needed to be wiped clean. So easy. Gotta love it. Smile. 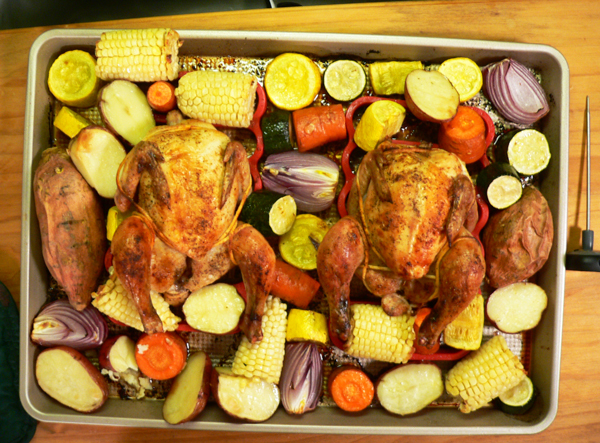 Follow our complete, step-by-step, photo illustrated recipe to make this delicious sheet pan dinner featuring Cornish Hens. 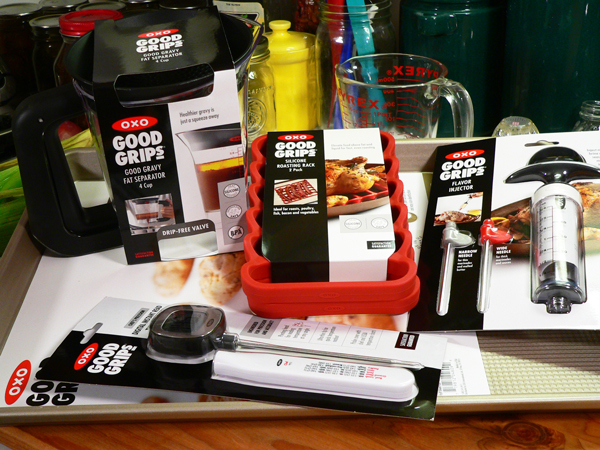 We’ve teamed up with OXO Good Grips for a look at more of their great tools for your kitchen. You just need one pan to make a complete meal. Cornish Hens must be completely thawed before roasting. 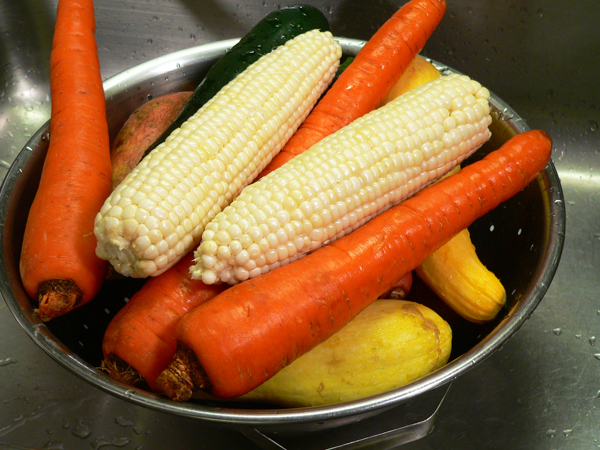 Rinse all vegetables under cool running water, set aside to drain. 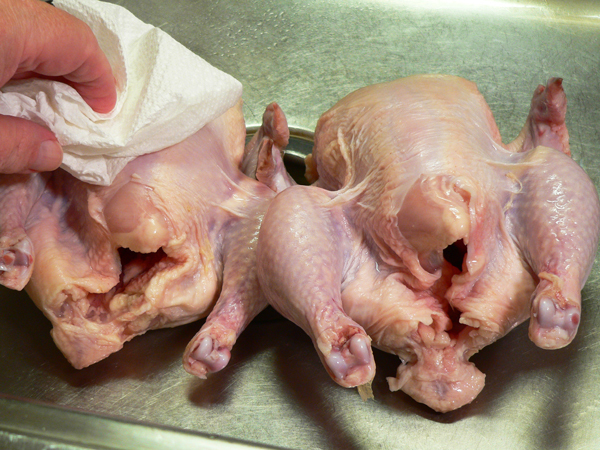 Rinse the game hens under cool running water, pat dry with paper towels. 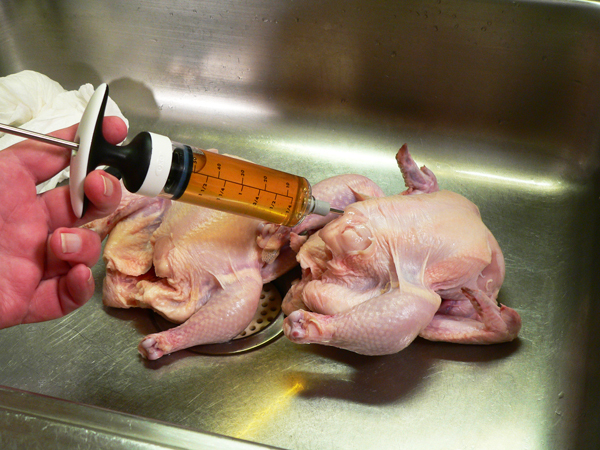 Inject marinade into hens if desired. Place breast side up on roasting pan. Season hen with salt and pepper as desired. 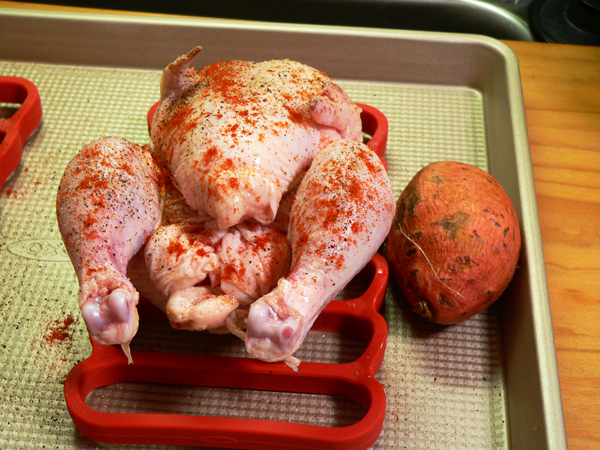 Rinse the sweet potatoes, place on roasting pan with hens. Place the sheet pan in the preheated oven. Remove husk and silk from the ears of corn. Cut into smaller pieces. Slice the red potatoes in half. Place in large mixing bowl. Cut the yellow squash into chunks. Add to bowl. Cut the zucchini into chunks. Add to bowl. Cut the carrots into chunks. Add to bowl. Drizzle the vegetables with a small amount of olive oil. Toss well to coat. After hens have been roasting for 30 minutes, remove the pan from the oven. Spread the vegetables around the pan in a single layer. Sprinkle with salt to taste. Baste the hens with a small amount of butter. Return the pan to the oven. Continue to roast the hens until done. Internal temperature should reach 180F degrees. When done, remove from oven, let rest 10 minutes before slicing and serving. Your Comments: Have you ever tried a Cornish Hen? How did you like it? I absolutely love your website, I try to save all your recipes. Love Cornish hens, will be trying your recipe for Christmas dinner. Thank you!! I have been making Cornish hens for a long time. They are so easy! I have a recipe I’ve been using on and off for years. It’s got whole cranberries, kiwis, and something else that I don’t remember. But there’s a marinade/sauce with orange juice, honey, olive oil, and herbs, and you remove the skin too. It’s one of my favorite things to make, and everyone seems to like it. Thank you for reminding me! Happy Thanksgiving! My family loves Cornish hens and we have had them several times for Thanksgiving thru the years. Your recipe looks great and I have cooked this very similar with a whole chicken but never with the hens – will probably do this the next time we fix them. Hope you have a great Thanksgiving. I had my first Cornish Hen a few months ago. I absolutely loved it. It is my plan to prepare Cornish Hens this Thanksgiving. Your recipe (as with all of them) looks superb. Thanks Steve, you were right on time. Cooked the Cornish hens (hen), one is enough for my sister and me today, did not get to it on Saturday. Turned out wonderful, much better than the ones from 45 plus years ago. Will even cook this again. My sister was really interested in the hen, she had never eaten one and was pleasantly surprised that it tasted so good. I am not a lover of olive oil, so only used a little on the hen, and melted butter, yes, real butter drizzled over the vegetables. Good eating and will make this for the family may try to talk them into this for Thanksgiving or Christmas. But probably will not have any luck. Thanks again, and have a blessed week. I love cornish hens. One cooked any way is just enough for my wife and I. We will try your recipe. Thanks for the recipe! I love Cornish hens and will have to try this soon. I’ve even got a couple in the freezer right now. Steve, I have never tried Cornish Hens but will certainly try this recipe. I’ve never cooked Cornish Hens but have thought about it when I see them in the grocery store. Now that you have shown how to fix them I’m going to try them this week! It’s always a good idea to perk up family meals. Haven’t cooked Cornish Hens but once, about 45 years ago. Must not have done a good job since I have never repeated it. However, have now got the hens and vegetables and will cook them tomorrow. Thanks for all of your work on the recipes and website. have not had Cornish hens since i was a kid! the recipe looks wonderful, need to try it !! I have never tried Cornish hens but you make them look great. Thank you! I love the taste of Cornish hens for special occasions. I usually put them in my smoker or right on the grill with indirect heat. This recepie looks greaat. 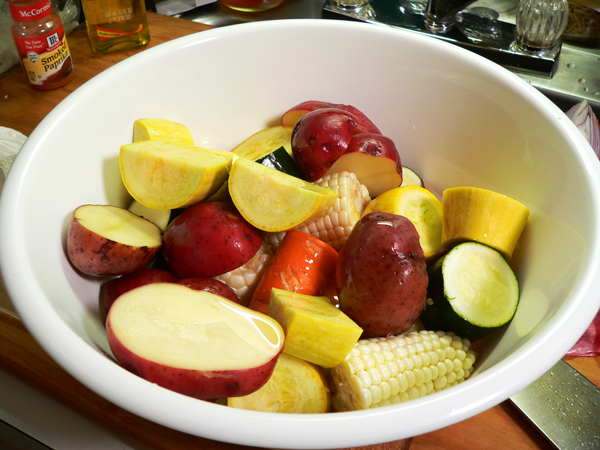 Roasting vegtables in the oven together is always a great blend of flavors to access any meat they are accompaning. This is one recepie I will deffinantely try in the near future. Hi Steve! I love your newsletters and I look forward to them every week. I haven’t tried a cornish hen but I would love to try them. I am looking forward in trying your recipe you posted. God Bless You Steve. I’ve always cook these little delish hens but I roast them and have wild rice & greens and cornbread. Now I have a different way to cook them using your recipe, just might have to try this recipe out for Thanksgiving.. Thanks for sharing all your lovely recipes with us. Please have a nice weekend. Thank you for the reminder — I used to buy two to four individually frozen Cornish Game Hens when they went on sale in the grocery store. They made a great meal for my daughter and me, with leftovers for the next day or so. Think I’ll try some soon! I use to bake them often but it’s been years. After seeing your recipe and the fact it’s a one pan meal I’m excited to give it a try. I love one pan meals because I’ve gotten lazy in my retirement lifestyle. It has been years since I cooked Cornish hens, but the pictures you have posted for this recipe may just inspire another try. Gosh! Looks delicious! How was the hen you injected? I have never tried Cornish hens, but these look so good. And I like that you can add injected flavors for each one, maybe two differently spiced and share them. I will definitely give them a try. Never get tired of your recipes, would like to have a new every day! I love Cornish hens and usually grill them so I’ll have to try and cook them this way! So enjoyed reading your writing on this topic–as well as on prior topics! Your writing takes me back to my Arkansas roots and provides inspiration for my current NC preferences for delicious food. Over the years I’ve cooked Cornish Hens with cranberry-orange glaze and served with wild rice, apricot or orange marmalade, apples and brandy, and more. I’ve always considered them a festive and special entree with one hen for each person, fairly easy prep., and excellent options for presentation. Now, though, I’m loving the efficiency of sheet pan dinners so will try a version of this. 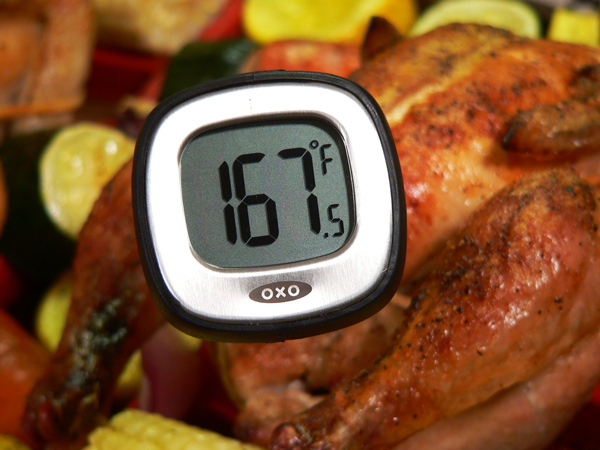 Just wish I had the large font, swivel OXO digital instant thermometer so maybe I need to put it on my wish list of holiday gifts. Thanks for your clear writing and even more for your passion related to really good food! I have never cooked these myself but do remember a friend serving them many years ago. But I can’t remember if I liked them or not! However, I have to say that your finished product looks so delicious I’ll definitely have to try your recipe. Both the hens and the veggies look yummy! I’ve never enough thought about making Cornish hens, but after reading this, I think I will try it! My husband loves roasted chicken and I love all the veggies so it sounds like a win win situation! It has been a long time since I had Cornish hens. This recipe looks delicious and easy. Printing out the recipe to try out in the near future. I enjoy your letter each week. It brings back memories and makes me smile! Thanks Steve and God bless you! It looks like Santa came early to your house. I’ve never cooked a Cornish hen but this recipe looks like something my husband could go for and I might just give it a try. Thanks! I would definitely give this a try. Looks delicious!!! I have had cornish hens many long years ago. I need to revisit this kind of meal. I would definitely try this recipe when I do. Be great for the upcoming holidays. I haven’t cooked cornish game hens in probably 40 years. I now live with my daughter,her husband and my two precious little granddaughters so I think it’s time I cooked these again because I know they have never had them. I will definitely be trying your recipe because I love sheet pan dinners. Cornish hens with crawfish dressing, yummy. This is a wonderful idea! I have tried Cornish hens once when I was dating my future husband. Being a novice cook at the time I was exhausted but delighted with the results. I also love roasting the veggies with the meat. This is a perfect comfort menu for Autumn in the Pacific Northwest. I’m going shopping later today so guess what’s for dinner Saturday? Thank you for the recipe and advice about the injector…that’s on my shopping list too. Keep the menus coming! I’ve never tried Cornish hen, but I would definitely give this recipe a try. I love one pan dinners. I really liked the way you incorporated the different colored vegetables around the hens. The finished result looks like the harvest and is appropriate for Thanksgiving! Earlier in the week I made something similar, but I utilized two smaller chickens. Next time I’ll call the Chicken ‘Cornish Game Hens’ and will add a bottle of wine to the meal. That should suitably impress my wife Amy; don’t you think? I haven’t fixed Cornish Hens in years, not sure why. I always basted with orange marmalade, but this recipe sounds great. I’ll definitely give this recipe a try. Thanks. I’ve never tried a Cornish hen but this recipe may make me try it. Looks easy enough for even me. Hi Steve, and Blessings to you and yours this beginning of the Holiday season ! Cornish Game hens !! What a novel idea for Thanksgiving dinner !! I have made them in the past but without the roasted vegetables. I would usually have some corn and/or mashed (smashed potatoes my Son used to say) with some gravy made from the Chicken leavings. 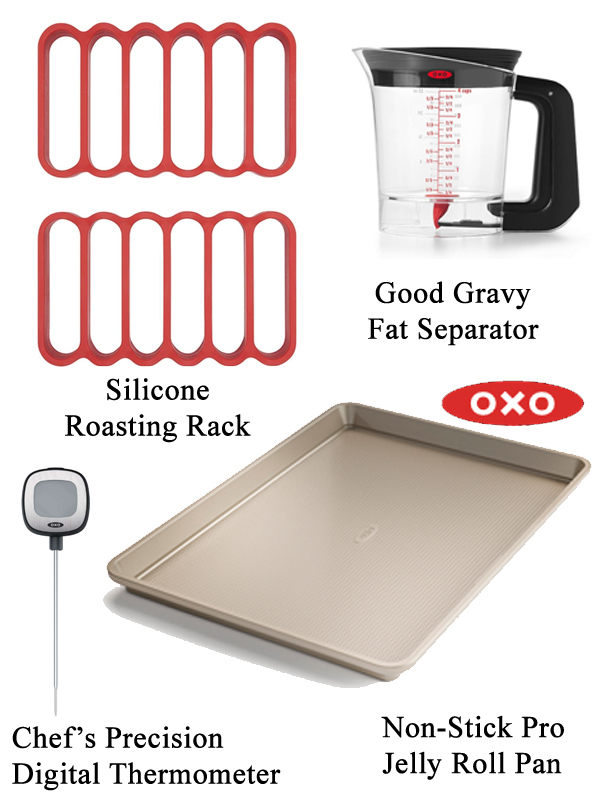 I love the OXO gravy separator idea as well as the OXO digital thermometer as there is nothing worse than cutting into your chicken to find a bloody mess. I plan to make this recipe for Thanksgiving this year with some slight variations and before I forget… the OXO flavor injector is a wonderful idea and in the past I have injected a little garlic butter and sage with some poultry seasoning herbs to give the birds more flavor !! Thank you for this wonderfully convenient way of cooking a bird or two or three for Thanksgiving !! Blessings !! Looks good, will give it a try. Often eat quail, but not so much the Cornish hens. I have never tried Cornish hens. This looks really good though. I may just try it soon. Have never tried cornish hens before. I think I would like to try your recipe it looks simple and delicious! Have always wanted to try Cornish Hens as a treat for my family. This recipe looks like a great one. Thanks again, and God bless! I have never tried Cornish hens before, they always seemed to complicated and fussy to make when reading the recipes. But with this recipe I am ready to try it! My husband and I love to have roast Cornish hens with all the usual Thanksgiving sides…perfect for the two of us. Hi Steve, I have cooked these before but it was in the 70’s! I have not thought about them in ages. Love your recipe cooking them with all the roasted vegetables as a one pan meal. Thanks for reminding me about them! I always thought they were “fancy” eating for some reason. Will definitely try this soon. I have never made a Cornish hen. The ones I see in the store are small and I love the idea of “personal” sized food. I would definitely try this sheet pan recipe. I have never tried Cornish hens, but after seeing this recipe, I am going to be having them soon! Oh my goodness Steve…!!! This took me back to my childhood days. I remember so vividly (and you’ll think this is funny) my father buying Cornish hens for a holiday meal instead of turkey. Oh my we thought we were too poor for the turkey and the Cornish hens were a “substitute”. LOL.. My mother would roast them much the same way you did, with the Thanksgiving flavors. So tender and juicy, but boy did we feel deprived with no turkey. Now that I’m older, I laugh because I would give my eye teeth to have a Cornish hen for the holidays. Ahhh…the good ol’ days. Blessings! We used to do Cornish hens while camping with my Boy Scouts. We would mount them on a wooden stick and arrange them around the campfire. We found out they took longer to cook than we planned, so the first try ended up being a late supper for the boys. But they were tasty and allowed the boys to cook their own food! This looks like a nice meal for a good change. Will give it a try! I’ve never tried Cornish Hens, but this recipe looks yummy and not too complicated. I will have to give it a try – thank you! My mother served us Cornish game hens once and I’d definitely try this recipe! As I remember, the game hens were very good but I’m pretty sure my mother didn’t do anything besides roast them with dressing on the side. I have never tried a Cornish Hen before. They appear to be small and one person could probably eat a whole one by himself. I have roasted Cornish hens a few times. They are very nice for a fancier meal or when we celebrate an occasion. I have not used this recipe but will, made me hungry just reading it! Thanks for another great receipe. This looks delicious and very easy to prepare: I will certainly be trying this as I have 2 in my freezer. Did not know exactly how to prepare them. Thank you. My family loves these little birds, we have had them several times for holiday’s .we have prepared them roasted, grilled, and even smoked. They are delicious, especially when prepared with roasted vegetables. 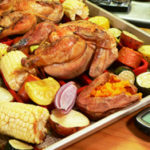 I love Cornish hens and never thought to do them for Thanksgiving but what a great idea for just the two of us. 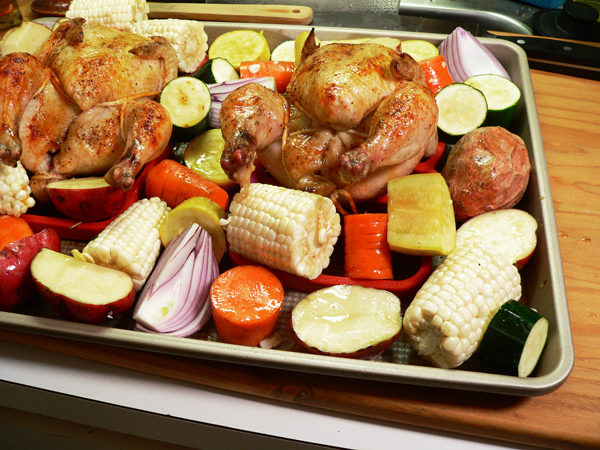 I like sheet pan dinners also and love to roast the vegetables like this as it brings out the flavors. I am a seasoned cook but this recipe is easy enough and looks delicious!